Some public duties can’t be shirked. One essential is the right to a public lawyer if a defendant is too poor to pay for a private attorney. That may seem to be a given in this society, but in San Francisco, a civil liberties stronghold, it’s strangely not the case. Mayor Gavin Newsom wants to cut $1.9 million from Public Defender Jeff Adachi’s $22 million budget. The trim, in the name of budget balancing, comes with a dose of political payback since the two have feuded for months. “I didn’t intentionally want to get into a game of budget chicken,” Adachi said in a recent editorial board meeting. Public defenders throughout the state are facing similar cutbacks – and many lack the clout to do anything about it. As the state’s only elected public defender, Adachi has a formidable following and considerable political nerve. So the fight is on. The proposed cut is seriously shortsighted and dishonest. If a defendant can’t get a public defender, the job goes to a pool of private lawyers where one will take the case – and bill the city. Total savings: just about zero. A report by City Controller Ben Rosenfield presented the gritty details, which should serve both sides in this debate. But the study upholds Adachi’s central point: The city can’t cut his budget and expect major savings in carrying out fundamental duties to provide indigent legal rights. The report found that public and private attorneys cost roughly the same, a claim that undercuts Adachi’s belief that his staff is a bargain. Adachi’s staff of 90 attorneys now handles almost 29,000 cases a year. While misdemeanors are dropping, time-consuming felonies are up in response to policy directives by the police and district attorney to focus on serious crime. The public defender’s office cannot be immune from the economic realities facing city government. However, Adachi says these budget cuts will hurt his operations while not saving very much. The $1.9 million cut proposed by the mayor, he believes, will result in $1.4 million in private lawyer bills after he’s obliged to lay off 10 lawyers and farm out cases his remaining team can’t handle. In addition, there will be court delays and added jail time for the accused while private representation is lined up. In some cases, outsourcing makes sense and can yield great savings. In this case, it does not. 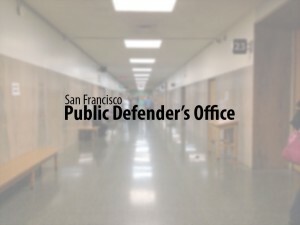 Is SF privatizing legal defense for the poor?